My family moved recently. We moved to a new city, a new state, a new climate, a new region of the country. We've been through this before and my three-year-old handled it pretty well. I know many coping tools and ways to help kids with moving. I anticipate different behavior and I'm not surprised when it does happen. But, the undesirable behavior is still frustrating. It's still a struggle and it still takes its toll, even when I expect it. I'm currently struggling a bit with my three-year-old's behavior. For about a month, he's been an excessive bully toward his older brother, and throwing tantrums that are not like his usual demeanor. He's always been outgoing, risk-taking, loving, and a bit "wild," but despite my best efforts and techniques I'm losing my patience faster and have been talking with my husband a lot about how I've been approaching this issue. I even talk to my seven-year-old about things he can do or say so he feels more empowered to show his little brother that he won't let him continue to treat him badly. My three-year-old has figured out how to push his buttons... and mine. So we listen to each other, we come up with ideas together, we spend more time playing together, we spend time playing apart, we talk, we hug, we keep trying. I am mentally spent. I've been using everything I know, everything I have been taught, everything I have read to help me stay calm and deal with this rationally, but sometimes I still yell, or take something away instead of teaching what to do because I am exhausted over the number of times I need to practice this with my kids. It always takes longer than you think it will, even when you know it won't be a short ride. All is not lost in my household. I have seen improvement, undesirable behavior is changing, and some techniques are sinking in and being used by both of my kids. I am being more patient, slowing myself down, and taking a moment to collect myself back to where I'd like to be so I don't make things worse. 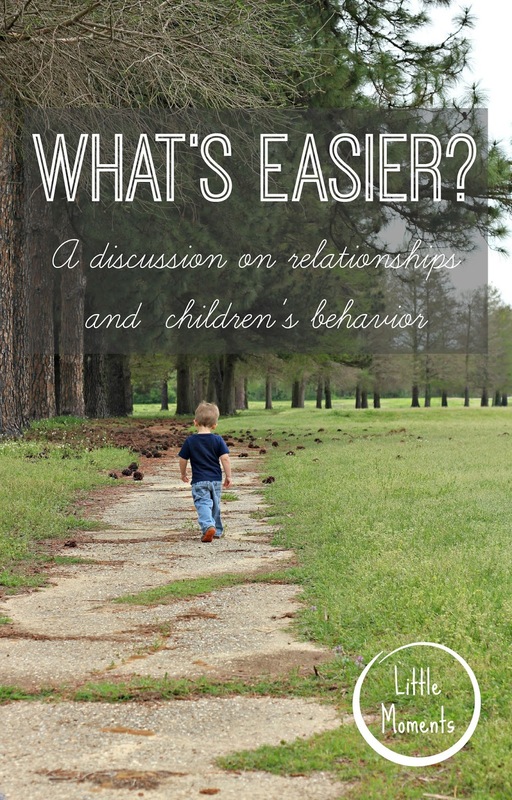 Working on behavior issues with your own children? Or working on behavior issues with children that are not your own? I have worked with many children that are not my own. In my experience, I have found that I'm more patient with someone else's child. It feels awful to write it but it's true for me. I want to be just as patient with my own and I try very hard to, but there is a history, a pattern, an emotional tie that is hard to ignore. You would think having a relationship with a child would make it easier, and there is truth to that, but because I intimately know everything I have done, and all the work I've put into helping my own child I struggle more. I struggle to not get too emotional about it and use all the wrong words. I struggle to give my own children the extra time they need to practice their behavior because I hear that little voice in my head saying, "they should know better by now." My husband thinks it's easier to work with our own children than other children because of that relationship. It's the relationship that links our disagreement. He feels more patient teaching our boys what is and isn't appropriate, and I feel more patient with a child I have no relationship with because I don't know what they have experienced in their lives or coping mechanisms they may or may not have been taught. Not knowing their background as intimately as I do my own children is what makes me more patient. I cannot meet a child where they are at and build on what they do have if I don't know where they are coming from yet. I don't have the same kind of emotional connection with another child, so my head feels a little more clear of the personal history that can clog up my head when working with my own. and look at their behavior (and my own) from another angle. Because people, young and old, grow and evolve so that their relationships can progress too. What are your thoughts? What do you find easier? Is that relationship a little bit of a barrier, or more of a bridge? Stay up to date on all our Little Moments and more; like our facebook page!